FARC guerrillas at a Colombia jungle camp last fall. Under last year's peace treaty, FARC agreed to disarm and confine its fighters to demobilization camps. But a small number of dissident rebels continue to extort business owners. In the southern Colombian jungle town of San José del Guaviare, construction workers repair a beer warehouse that was partially destroyed by a bomb. There are shrapnel holes in the ceiling and a small crater in the sidewalk out front. The attack came last month after warehouse manager Javier Montoya refused to hand over large sums of cash to a small group of dissident FARC rebels. "I'm confused," Montoya says. "I never thought this would happen during a peace process." During its half-century war against Colombia's government, the FARC rebel group earned millions of dollars extorting business owners, a practice which was supposed to have ended under last year's peace agreement. Under terms of the treaty, nearly all of the FARC's 7,000 fighters have gathered in special camps where they are handing over their weapons to U.N. monitors. 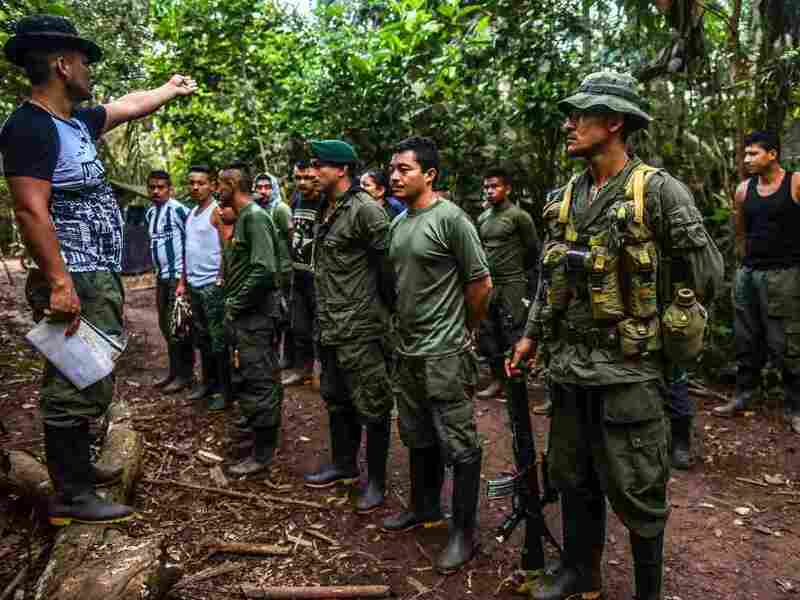 But about 160 FARC rebels broke away from the main group last fall and now operate from jungle hideouts near San José del Guaviare. Analysts say these breakaway guerrillas are out to enrich themselves through drug trafficking, illegal gold mining and extortion. Merchants in San José del Guaviare are some of the main victims, says funeral home owner Alexander Bermúdez. Bermúdez says he receives up to 20 calls per day from dissident FARC members demanding payoffs. To prove his point he holds up his iPhone and reads through its call register. "FARC, FARC, FARC, FARC, FARC, FARC," Bermúdez says. The peace process has provoked security breakdowns elsewhere in Colombia. With the FARC rebels confined to demobilization camps, some of the territory they once occupied has been taken over by other armed groups. In the northern state of Choco, recent clashes between drug trafficking gangs and a small guerrilla group, called the ELN, have uprooted thousands of people from their homes. Meanwhile, the break-away FARC fighters have killed several army soldiers. Last week, they kidnapped a U.N. peace monitor. All this frustrates Col. Federico Mejía, chief of the army base in San José del Guaviare. "The rebels are tough to target because they work in groups of three or four and dress like civilians," he says. "The large FARC camps of the past could be bombed." Still, Mejía claims the peace process has vastly improved security in the region. Local business owners disagree. They claim that extortion is a bigger problem now than when the war was raging. Hundreds of merchants recently marched through the streets of San José del Guaviare to protest. Among them was Montoya, the warehouse manager. Montoya says he will not give in to blackmail. But he's a nervous wreck. He plays a phone call he recorded from what he said was a FARC dissident. In it, the caller promises that there will be no more bombings at his warehouse as long as Montoya forks over the cash. In the audio, as in a previous Web version, this story states that breakaway FARC fighters briefly kidnapped a U.N. peace monitor last week. The kidnapping has not yet been resolved.